The wildly popular daily companion for divination and illumination The Circadian Tarot offers a modern, accessible approach to guidance, authored by Jen Altman with stunning artwork by Michelle Blade. Dreamscape watercolors beautifully depict each of the 78 traditional Tarot cards. Click for more as Michelle herself shares a bit behind the project and gives us a peek into her life as a mother and artist. When we first discovered Michelle's art, it was through Myspace over a decade ago! It's been a thrill to see her evolution and acclaim as an artist, and one can appreciate the thoughtful continuity in the spirit of her work- often a sense of vivid beauty in both the mystic and the mundane. So it seems fitting that one of her most recent collaborations would be illustrating the stories of the Tarot. PS: Tell us a little about how this project came to be. 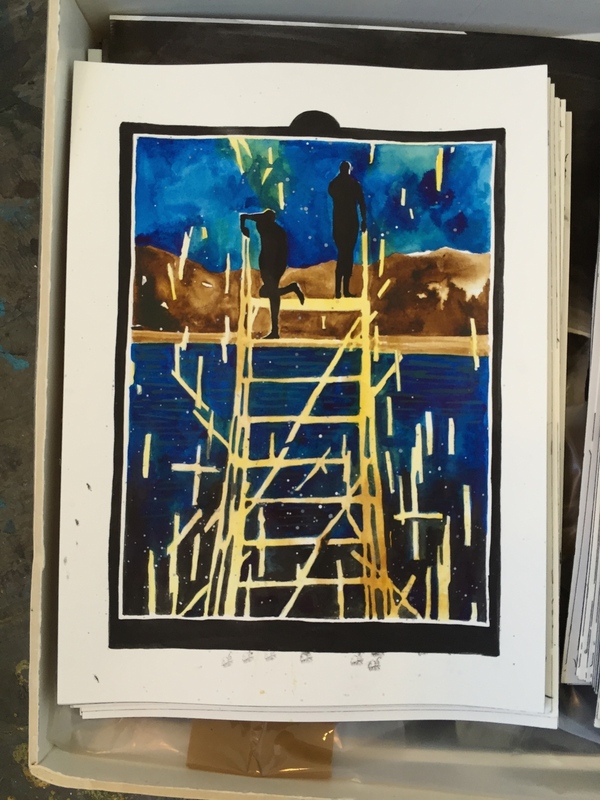 MB: About two years ago I was having breakfast with the Arts Editor at Chronicle and she brought up the idea of making a Tarot book that you could carry around and open spontaneously, to any given page, to get a quick one-draw reading. I was immediately interested and the writer, Jen Altman, and I dove in deep with our research and conversations about what the cards should express and how they could be characterized. 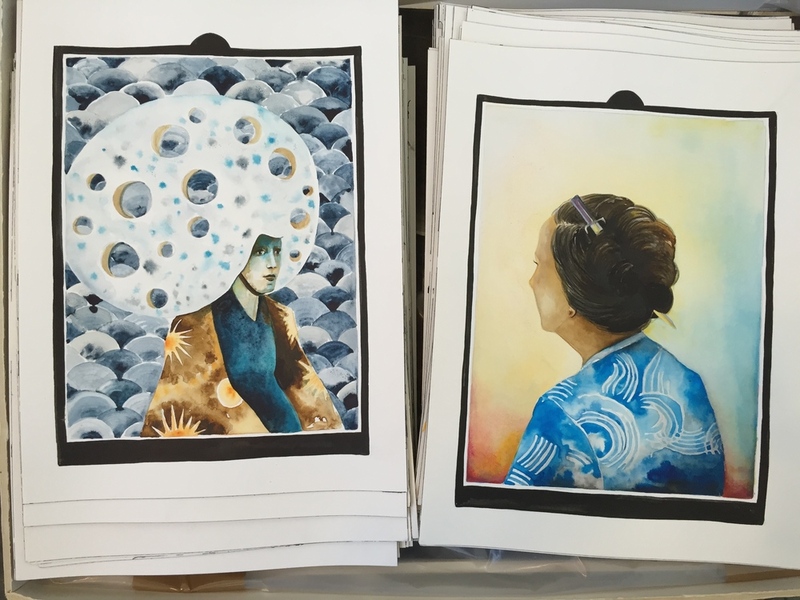 *Michelle's snapshots of original pages from The Circadian Tarot. PS: Congratulations on the success of the book! I notice you never seem to stop creating. Between your own impressive paintings, installations, and clever subscription series , how do you balance Motherhood with your art? MB: Being an artist is my full time job so I work hard and try to be as productive as possible with the time I have. In the beginning it took some finesse to find the right schedule but we found it and it's working well now. Because time is so valuable I feel like I've gained a new kind of focus that I didn't have before, it's a "Now or Never" mentality and I'm thankful to my daughter for that. PS: Has your work changed since becoming a mother? MB: I think the work is still conceptually in line with the work I have always made but technically it's progressed as one's practice does over time. Little hands: Lula, almost 2. PS: What keeps you inspired? MB: Lately, listening to podcasts about the human experience, specifically stories about personal triumph, is what I find inspiring. Every morning I walk around the lake near our house and listen to one after another. It lifts me up and I'm a complete junky for that feeling. I also enjoy watching videos on NOWNESS with my partner in the evenings. Some of those short works absolutely pull at my inspiration strings. I always find myself yearning to convey what video can in paintings. There is something so good in bringing that kind of yearning back into the studio, it keeps me curious. PS: Any new projects down the road? MB: I'm in the beginning stages of creating a new body of work for an upcoming show at my gallery in SF next year. Aside from the I'm also knee deep in ceramic love. I've gotten addicted to attempting sculpture and am looking forward to seeing what it leads to. Michelle Blade's work has been exhibited nationally and internationally at Jack Hanley Gallery, SF; Roberts & Tilton, LA; Bravin Lee Gallery, NYC; Western Exhibitions, Chicago; The Center for Contemporary Art, Santa Fe; Union Gallery, London and V1 Gallery, Copenhagen among others. She has been featured and reviewed on NPR's All Things Considered, within The New York Times Magazine, The Los Angeles Times, The San Francisco Chronicle, as well as 7x7 and Juxtapoz Magazine. She is a 2007 recipient of the Murphy-Cadogan Fellowship, A 2X2 Pro Arts Grant, an Alternative Exposure SOEX Grant, and was a SFMOMA Seca finalist in 2010. Blade is represented by CULT Exhibitions in San Francisco, CA. and works with RVCA as part of their ANP (Artist Network Program). Photo from MichelleBlade.com. Follow Michelle's work and family on Instagram.